The trail’s route in North Albany is marked with a thin red line. Councilman Floyd Collins’ right hand spans the Willamette River. The blue at the top, that’s West and East Thornton Lakes. 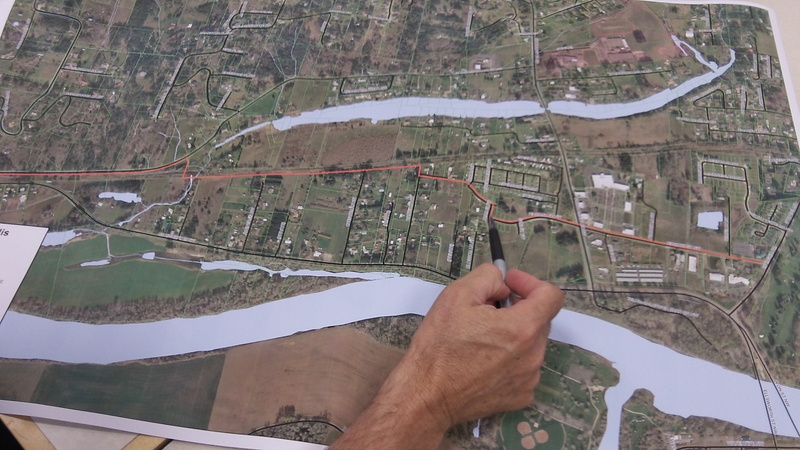 The planned Corvallis-to-Albany Trail has won renewed support from the Albany City Council. But its completion is still at least three or four years away. The council’s vote Wednesday was unanimous. Even Councilor Rich Kellum, who has some questions about who should pay for bike facilities, voted yes. Benton County engineer Laurel Byer expects the state funding, which has received preliminary approval but still needs a final yes from the Oregon Transportation Commission, will become available in September 2016. That will give Albany two years from now to do any required additional environmental assessment. Assuming it’s smooth riding from now till then, it’s possible this segment of the path might be built in 2017 or the following year. Starting at Scenic Drive, the trail for cyclists and walkers would head east in the space between Thornton Lake Drive and the Portland & Western track. Where the road veers north, the path would go straight south and cross the railroad, then head east again on the south side of the track. At Walker Lane, the path would go south for a short stretch and then east again, eventually connecting with Hickory Street. It would continue on Hickory to its junction with Spring Hill. 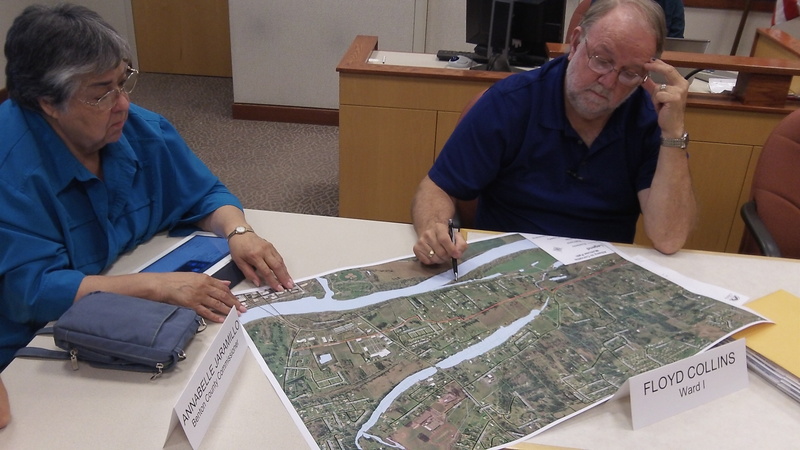 Commissioner Annabelle Jaramillo and Councilor Floyd Collins study the map. Meanwhile, Benton County this summer won approval of $2 million under the Connect Oregon program to build the path from Manchester Street in Corvallis to Scenic Drive at the Albany end. At last report, though, the county was still negotiating with farmers about the right of way. At a joint work session Monday, Albany council members and the Benton County commissioners looked at a map of the Albany segment of the long-planned path and got a refresher on the project. One of the prime movers behind the plan has been Commissioner Linda Modrell, who is retiring at the end of this year. Thanks again for staying on top of this one. Exciting to see it coming along. Been a long time coming but will be well utilized when it does. I am excited to see this moving forward. I am curious how they can plan running the path down Walker Lane without discussing it with the residents who actually own Walker Ln. Walker Ln. is a private street owned and maintained by the residents. It is a one lane dirt road barely large enough for the trash truck to navigate (they actually have to back up to pick up cans on the stretch of road this path is proposed on) The city and odot have refused to address safety concerns on the approach to hwy 20 from Walker Ln. and now without ANY discussion they plan to allow public access? I truly believe the city should speak to us about our cconcerns before moving this too far.